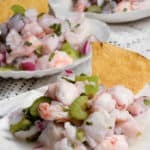 Ceviche de corvina is a white sea bass ceviche that is a delectable appetizer. 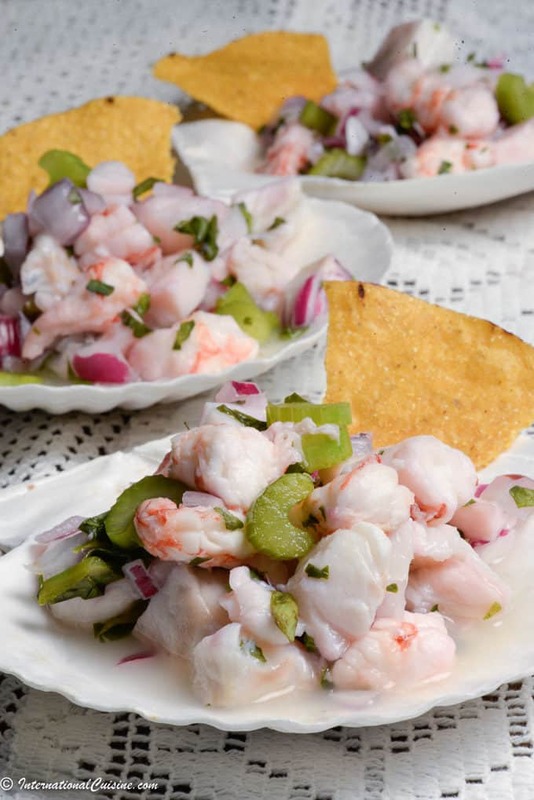 I love ceviche and seem to choose it as a starter for just about any country where it is loved. This recipe is different as it calls for celery in the mix which I have not had before. I absolutely loved the cool crunchy bite the celery provided next to the sea bass and shrimp. The fish is cooked in lemon juice and usually served with chips to scoop up the delicious ceviche de corvina with. In Panama City there is a famous fish market that is a must see destination. It is called Mercado de Mariscos. The main reason is that is where you will find stalls that make this prized Ceviche de Corvina made with the absolute freshest ingredients. One side of the market is where you can buy seafood right off the fishing boats you see in the bay. Whether it is sea bass you are after or lobsters or shellfish, you need to get there early to get the good stuff. The other side of the market is the where you can enjoy the beautiful seafood cooked and served up Panamanian style. Ceviche de corvina will be served up in a cup and will be a bite you won’t forget it. These are not fancy places but the food is top notch. The market is also located near the historic Casco Viejo District which is is now a UNESCO world heritage site. Until you can make it to Panama, be sure to enjoy this Ceviche de corvina with a nice Panamanian beer and dream about your next trip. Have you been to Panama? Let me know in the comments below and what your favorite food was while there. The lemon juice should cover the fish.